Thank you everyone to all who participated in the 2018 Route 66 Fun Run! We had 788 registrants, awards recipients can be found on the awards tab below. The 2019 Fun Run will be held May 3-5 and registration forms can be downloaded here. Check back on this page or at www.Historic66AZ.com. for event updates Below you'll find the schedule for the 2018 run, but don't you worry none, the 2019 Fun Run will be much the same format. 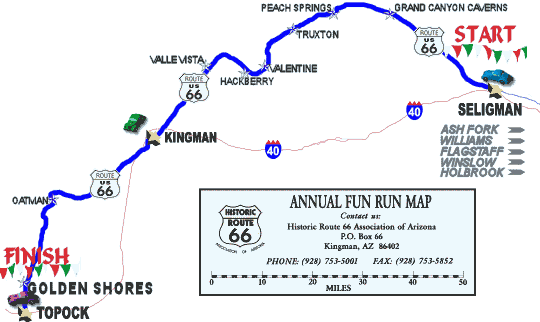 The Historic Route 66 Fun Run® began as a dedication of Historic Arizona Route 66 in 1988, which had just been decommissioned with the opening of I-40. 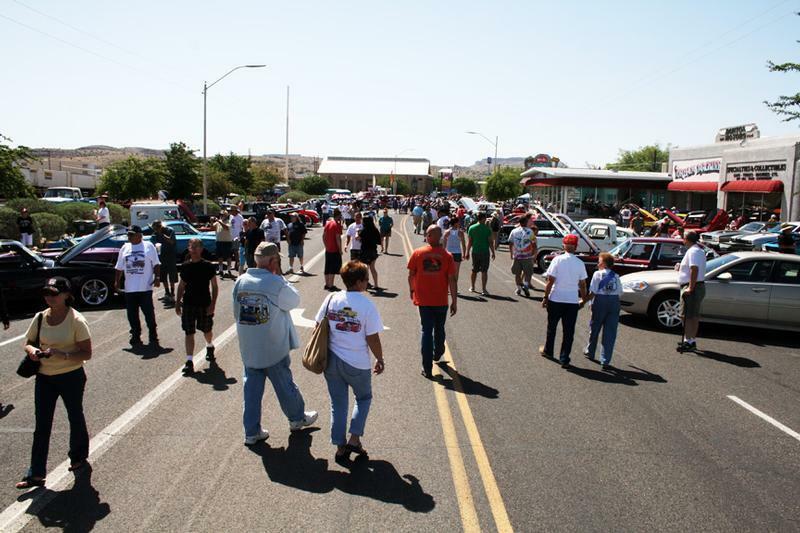 152 entries total the first year (1988) with over 60 cars making the complete journey from Seligman to Topock. During the festivities, Will Roger's Jr., son of the famous humorist and actor, said "In 1926, a man named Disney from Oklahoma... thought it was a good idea to call it Will Rogers Highway after my father... it was called Will Rogers Highway until World War II. I'm glad to be here and be a part of this moment and I'm very glad you're preserving it." [Governor Rose] Mofford lauds effort preserving Route 66 as historic roadway"
- Mohave Daily Miner, April 25, 1988. 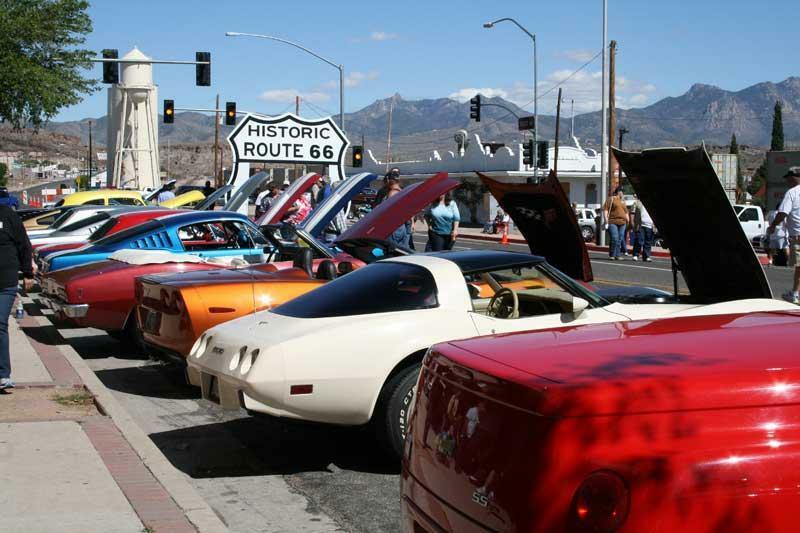 Today, as many as 800 classic, custom and unique automobiles show up for this fantastic celebration of Route 66! 12 noon to 6pm: Registration in Seligman at the ACME Building. For those driving into Kingman on Friday, participants need to register at the Kingman Powerhouse. Visitors can participate in First Friday in the Historic Downtown. 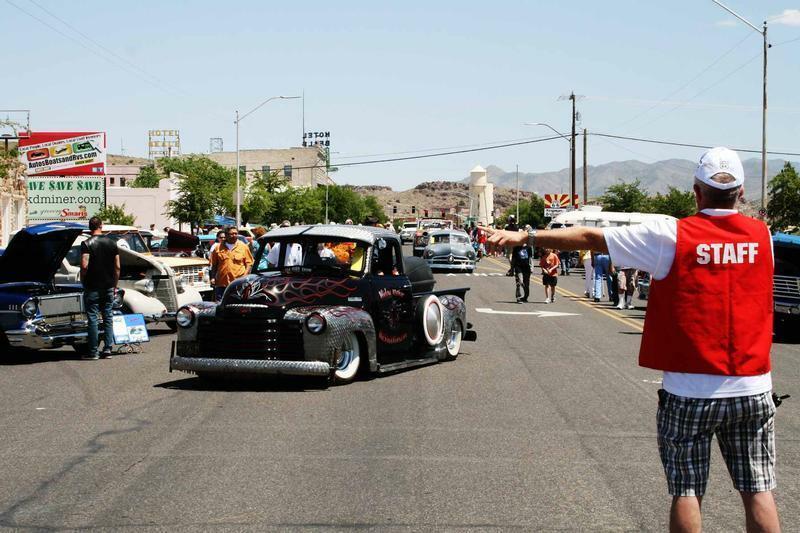 Upon arrival in Kingman between 11am and 3pm, we will be lining up vehicles (not only cars but busses, vans, motorcycles and RVs) on Route 66 (Andy Devine Ave) and Beale Street for viewing and Fun Run judging. Entertainment, activities and vendors will be downtown all day until 5pm. Saturday evening, participants can enjoy the night scene in Historic Downtown Kingman, or go out for dinner at one of Kingman’s eclectic restaurants. Sunday morning the vehicles will line up for the run to Topock/Golden Shores for the final get-together and awards - awards ceremony starting at 12:30pm. 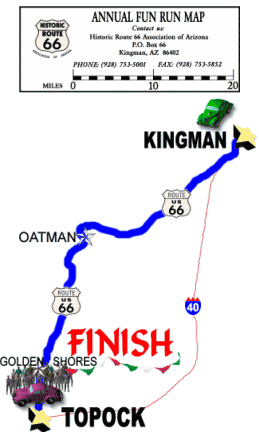 Again, not a timed run so there is plenty of time to stop along the way with Oatman being a fun place. We promise to have each and every burro in the neighborhood on the hoof to meet and greet our Fun Runners. Many participants extend their Route 66 experience and stay in surrounding Route 66 communities such as Ashfork, Williams, Flagstaff and even as far away as Holbrook. So, here is a little information on all of the Arizona Route 66 towns one might encounter along the way (East Arizona to West Arizona). Holbrook was founded in 1882 and accommodated early settlers and travelers. Later, the romance of the west attracted many Easterners and tourism became very important to the local economy. Holbrook had one of the first Fred Harvey Restaurants, housed in several old boxcars on a rail siding. It is reported that the nation's first tourist camp was built in Holbrook. 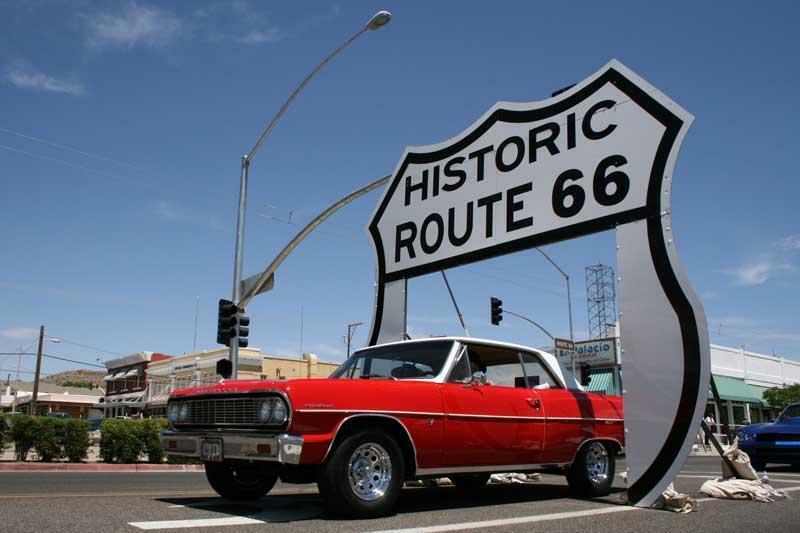 When Route 66 became the official transcontinental highway, tourism flourished. After the World War II gas shortage ended and tourism resumed, Holbrook became an overnight mecca on the high desert. One of the most memorable Route 66 landmarks is the Wigwam Village, which first opened in 1950. Today, the village has been completely renovated and reopened. Visit the Navajo County Courthouse, built in 1898 and now occupied as a museum of Holbrook's wild and colorful past. Tour the 1898 one-piece jail that was used until 1976. Nearby is the Petrified Forest National Park and to the south, Mogollon Rim Country with tall pines, lakes and spectacular scenery. Tour the Navajo Nation to the north; this is Navajo land, with ceremonies, traditions and outstanding arts and crafts. Visitors may also enjoy the Hubbell Trading Post, Canyon DeChelly, and White House Ruins. Winslow grew from a wagon trail to an Atlantic & Pacific Railway terminal in 1881. Winslow's growth was rapid and the Fenton Brickyard began producing millions of red and yellow bricks for schools, homes, churches, sidewalks, and the old Harvey House, which was built in the style of a Spanish ranch from the past. 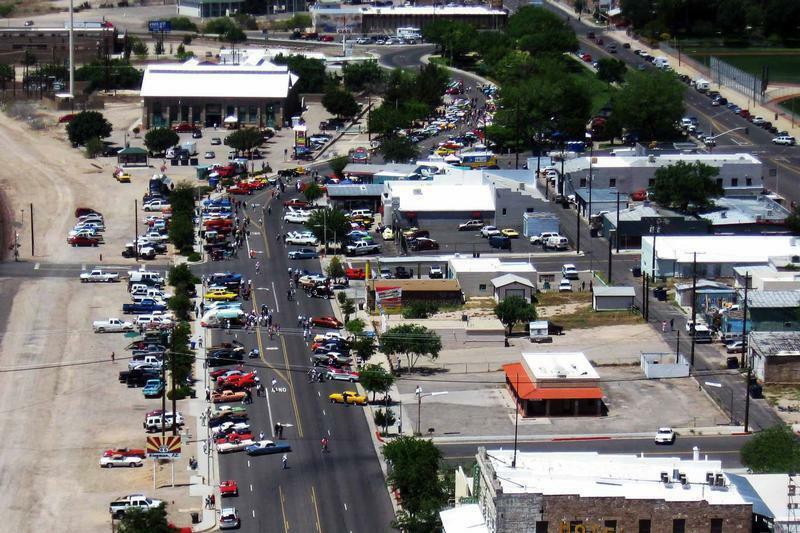 The advent of the automobile further enlarged the town, making Winslow a major stopping point for travelers along Route 66. Winslow is timeless...in touch with the past, in tune with the future. Many cafes, trading posts, motor courts, and garages operated all along the highway, and a few remain open today. You'll notice reminders of years gone by in forms very much alive, such as the original railroad depot and other historic buildings. You may see Native American women in traditional dress and cowboys right off the range. 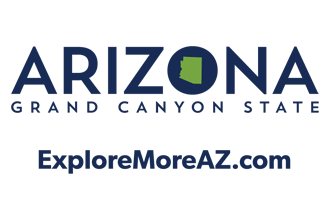 Explore the sights and attractions nearby, including the Homolovi Ruins State Park, the Little Painted Desert and Meteor Crater. Settled in 1876, Flagstaff was named for the tall pine tree used as a trail marker for California-bound wagon trains. This trail eventually became Route 66. For years, scores of Motor Courts and cafes beckoned to the weary traveler, and many of these have outlasted the coming of the interstate. The Santa Fe Train Depot has been revitalized as a Visitors Center. A "must see" is the Museum Club on Route 66, an old log structure built in 1918. Five living trees support the building, which now houses a dance hall and music club. The last Route 66 town to be bypassed by I-40, Williams is known as "The Gateway to the Grand Canyon." The one and one-half mile stretch of Route 66 through the heart of the small town was once thick with motels, restaurants and shops. Today, the little town is still active. The entire downtown area is listed in the National Register for Historic Places. Route 66 buffs will appreciate the neon signs of the intact 1940's "Motel Row." In East Williams is the Kaibab Forest, great hiking, horseback riding and fishing. 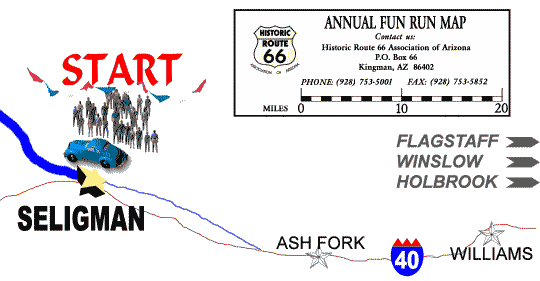 Ash Fork began as a stage depot, and grew with the coming of the railroad. Mining was important to its economy. Route 66 runs the length of the town and some motels, gas stations and businesses have operated since the highway's beginning in 1926. The town has six stone yards and ships beautiful Arizona Flagstone nationwide. Visit their "Settler's Cemetery," an old west grave site with wooden crosses and etched sandstone. Nearby attractions are petroglyphs (pre-historic carvings) in Partridge Creek, and a preserved portion of Beale Wagon Road Historical Trail. Seligman, a railroad town founded in 1886, is situated in the beautiful Upland Mountains of Northern Arizona. It was at a junction of the Santa Fe Railroad's main line. Santa Fe established repair facilities here, including the famous "Harvey House - Road House." 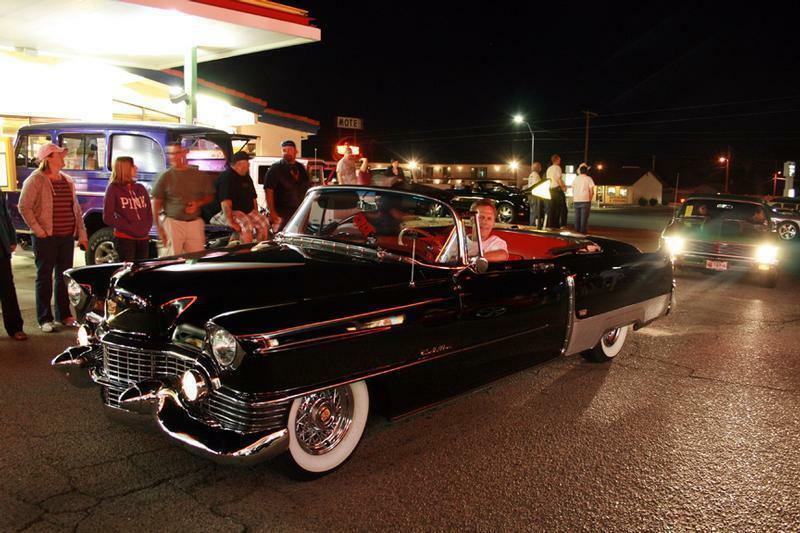 In the early Route 66 years, Seligman accommodated many travelers with motor courts galore. Seligman is rich in scenic and historic value. Today, a visit to this small town is a step back in time, and tourism is still an important part of the economy. Long-time resident Angel Delgadillo, the town barber, now retired, is one of the founders of the Historic Route 66 Association of Arizona and one of the most avid supporters of Route 66 in the country. Down the street, the Delgadillos Family operates the famous Snow Cap Drive-In, which was built by the late Juan Delgadillo, Angel’s Brother, out of scrap railroad lumber. It supplies a generous serving of humor along with your food, and a stop here will certainly be remembered! If you have ever seen a national TV show or read a book about Route 66, it is almost certain that you have already been introduced to this fascinating town and its memorable people. 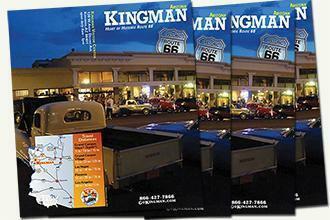 Be sure to pick up a Seligman Walking Tour Guide at the Visitor's Center. A grinning green dinosaur welcomes visitors to this long-familiar tourist attraction. What is now the largest registered dry caverns in the United States, and third largest in the world, was once the bottom of an ancient ocean that covered the southwest. Discovered in 1927, the caverns offer a forty-five minute underground guided tour. You will drop twenty-one stories by elevator and walk through a string of caverns, some the size of football fields, with stalagmites, onyx, flowstone formations and the largest deposit of Selenite crystals, including helictites. The Lounge/Bar is open along with the mini-mart and fuel. The Route 66 giant parking area and the Caverns building parking lot are paved and connected by paved road to keep all the great vehicles clean and safe. Services Available: Privately owned attraction offers gas, motel, restaurant, gift shop, campground and horseback rides. Route 66 crosses the southern boundary of the Hualapai Indian Reservation, and Peach Springs is the headquarters of the tribe. Peach Springs was at one time a western terminal of the Santa Fe Railroad, with a road house, shops, a Harvey House restaurant, and a stage coach line. The Shell station in Peach Springs dates back to the 1920's and is soon to be undergoing renovation (no gas service at this time). Other buildings of interest are the Hualapai Wildlife Office and the new Hualapai Lodge, which houses a restaurant and small gift shop. Traveling twenty-one miles north of Peach Springs, is unpaved Diamond Creek Road, the only road into the Grand Canyon. Primitive camping is available along the river bank, however Tribal permits are required and may be purchased at the Hualapai Lodge. Also, from May to September, river trips down the mighty Colorado are offered by the Hualapai River Runners. Three miles east of Peach Springs, turn north and travel 63 miles on the paved road. At the end is "Hilltop," where a hiking trail leads down to beautiful Havasupai Falls on Havasupai Tribal Land. 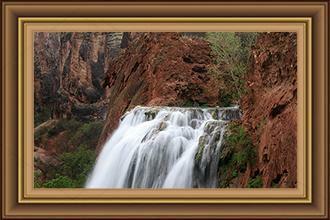 The hike is nearly nine miles to the bottom of the canyon, and the village of Supai. Reservations are required for camping on the Havasupai Reservation. Encircled by colorful and scenic terrain, this small community's roots stretch back to the Beale Wagon Trail. Years later, in 1883, the railroad followed with a water stop for its engines that became known as Truxton Station. Around 1950, plans were underway to build a new dam in the lower Colorado River, with the junction near Truxton. In anticipation of the traffic, Donald Dilts opened the Truxton Cafe and Clyde McCune built a service station across the street. This was the official beginning of the town of Truxton. However, plans for the dam were abandoned and the town maintained itself from travelers passing through on Route 66. In 1957, the Truxton Cafe and adjacent Motel were purchased by Ray and Mildred Barker. The Cafe was a favorite stopping place for many regular travelers of this section of Route 66. Established in 1898, Valentine is home of the Truxton Canon Agency Bureau of Indian Affairs, U.S. Department of the Interior. In May of 1900, 600 acres of land were set aside and an Indian School was built. The school opened in 1917 and closed about 1937. It was reopened later and used until 1969. The building still stands today. Beyond the railroad tracks, the remains of "The Little Red Schoolhouse" are visible. Built in 1924, it was used by the non-Indian students who lived in the area. Valentine is also home to Keepers of the Wild Nature Park. Keepers is an animal sanctuary giving more than 150 exotic animals a permanent home with beautiful rock formations, and natural vegetation. Animals featured include lions, tigers, wolves, many species of birds, hoofed animals, and more, all of which have been rescued from abuse and neglect. One can take a self-guided tour of the sanctuary or ride on a safari tour. Present day Hackberry is across Truxton Wash. A portion of the Old Trails Highway goes through the settlement. Hackberry Elementary School, painted red and white, can be seen on the edge of town. Built in 1917, it was in use until early 1994. The old Hackberry General Store now owned by John and Kerry Pritchard is open as a visitor center, gift shop, picnic area and rest stop. The newest community on Route 66 was established in 1972. Valle Vista boasts an 18-hole golf course and the Valle Vista Development . The section of highway just east of valle Vista is alleged by locals to be "the longest continuous curve on a U.S. Highway" - approximately seven miles. Access to rail and wagon route helped establish Kingman as a trade and transportation center. By 1882, Kingman was officially a town. Route 66 parallels the railroad track, and Kingman has always been a staunch Route 66 town with many motels, cafes, and service stations. Today, the I-40 Business Loop runs straight through Kingman, and is still a major stop for travelers. The old downtown area on Route 66 has not changed much over the years, and a brief tour of Andy Devine Ave and Beale Street will give you a glimpse of the past. Be sure to visit the Old Courthouse (where Clark Gable and Carole Lombard were married.) Locomotive Park is home to "Old Steam Locomotive #3759", which was donated by the Santa Fe Railroad. The Mohave Museum of History and Arts also provides an exciting look into the past. Downtown also has the Beale Hotel that was once home to Andy Devine, the famous movie personality. The office and gift shop of the Historic Route 66 Association of Arizona is located at Kingman's Historic Powerhouse (on Route 66.) The building is on the National Register of Historic Places and also houses the Kingman Visitor Center, Grand Canyon West Information Center, and the Kingman Area Chamber of Commerce. Kingman is centrally located for many interesting side trips on your Route 66 tour: Lake Havasu City (home of the London Bridge,); Laughlin, Nevada, the impressive little town of casinos on the Colorado River; and Hoover Dam. Las Vegas is only 100 miles away. Services Available: lodging, RV parks, dining, museums and services are plentiful. Cool Springs, 20 miles west of Kingman on Route 66, was the only gas station before heading up into the Black Mountains toward Oatman. It was rebuilt in 2003 (following a fire in the mid 1960's) using the original ruins. The gift-shop / museum closed early 2016, a re-open date yet TBD. At an elevation of 2,400 feet in the Black Mountains, Oatman was once the last stop in Arizona before entering the dreaded Mohave Desert in California. Oatman was founded in 1906 as a commercial center for nearby mining camps, and was at one time considered to be the richest gold mining district in the state of Arizona. The combination of mining and endless traffic on Route 66 made Oatman a boomtown. In 1953, Route 66 was rerouted through Yucca as the traffic had become too much for the steep, winding road. Today, the town's one street is lined with historic buildings and boardwalks. In the middle of town is the Historic Oatman Hotel, a unique, double-walled, adobe two-story building. Locals, dressed up as desperadoes, stage gunfights for the camera-toting tourists daily from noon to around 3pm. While in Oatman, be sure to meet some of the town's "wild burros." Descendants of the work animals of the mines, these burros have found paradise. They nuzzle along for handouts, wandering all over Main Street, posing for pictures and stopping traffic. These born hustlers are experts at playing the tourist game. Topock is a little desert settlement that sits on the east bank of the Colorado River. If you are headed West, it is the last Arizona town on the old highway, or the first heading East. The Route 66 River Bridge once carried travelers across the Colorado River toward Needles, California, and a long trek across the dreaded Mohave Desert. This old, arched steel bridge now supports pipeline, and travelers cross the river on I-40. The nearby community of Golden Shores has merged with Topock as one friendly community attracting family and retirement living. Historic Route 66 runs through this community after a nostalgic and scenic 22-mile drive from Oatman. Some books used to advise travelers that the portion of Route 66 between Oatman and Topock/Golden Shores was not recommended for travel. This is no longer the case. Through the efforts of the people of these communities, this portion of Route 66 has been completely resurfaced, is maintained, and provides a scenic and delightful drive. The Federal Bureau of Land Management has dedicated this section of highway from Topock/Golden Shores through Oatman to McConnico (west of Kingman,) as a "Historic National Back Country Byway." This truly signifies the importance and scenic value of this fascinating stretch of the original Route 66. The Havasu Wildlife Refuge is located just off of Route 66, and the Colorado River at Topock provides unlimited opportunities for water sports and recreation. For a tast of what's to come, here is a Video courtesy of Frank Kocevar and www.route66experience.com with scenes from the 29th Annual Route 66 Fun Run in 2016. 29th. 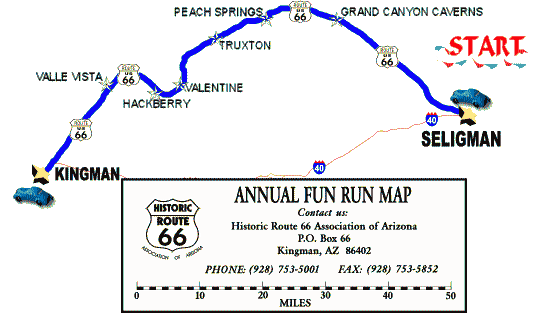 annual, "Arizona Fun Run 2016", from Seligman to Golden Shores from Route 66 Experience. Thank you for visiting http://www.gokingman.com/event-66FunRun! Be sure and revisit gokingman.com frequently for content updates and more.